Stuart has a great interest in, and memories of, marching jazz bands in not just our area, but in general from participating as a band member in competitions and a wealth of personal experience. 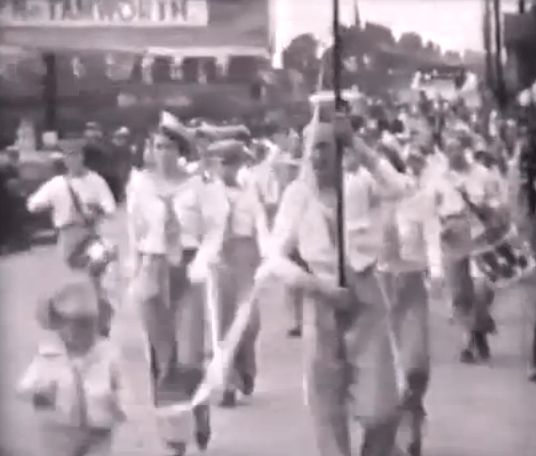 Cinefilm image of unknown band marching in Brownhills, thought to be from the interwar period. Image from the Midlands Media Archive. This, I know, will be of interest to all readers and particularly the artist formerly known as Bev Lloyd, who recently asked me to promote a site concerning this history, for which I’ve lost the post. Please, Bev, if you’re reading, drop me the link and I’ll edit it in. This has been a mammoth post to edit and has taken hours to do the links, but it’s so well written that it’s been more than worth the effort. I thank Stuart for his wonderful piece, and for shining a light into a bit of local culture that I have absolutely no knowledge of. As ever, comments and email welcome: BrownhillsBob at Googlemail dot com. Cheers! The artist formerly known as Bev Lloyd let me know that there’s currently a marching band operating in Burntwood: Burntwood Adfatonions. We’ve lost their Facebook page, but Clare Cole runs the show. Bev also pointed out that there’s a nostalgia page for the Brownhills Tartans Jazz Band also on Facebook. Cheers to Bev for that, and my apologies to Bev for being a klutz and losing the original mail. I thought it might be worth putting together some information on the children’s marching jazz bands that were popular back in the 70s, I was in the drum section of one from Burntwood 1970-77, the Bluebirds. At one point nearly every town in our area had one, each with about 30 members they would compete at carnivals up and down the country during the summer months so the chances are that they touched the lives of some of the readers of your blog at some point. 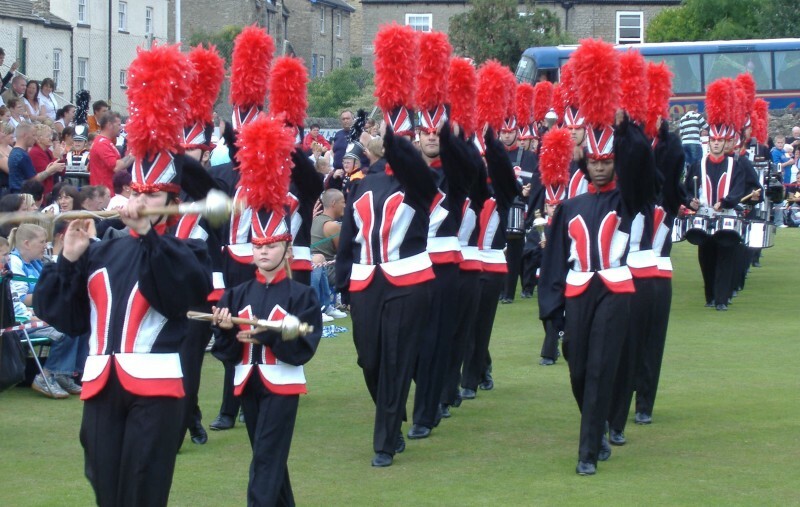 Lots of information about the culture, history and music of marching bands can be found at Marching Elite. Jazz bands go back to around the 1920s and 30s where they were originally found in the North East and across the Welsh pit villages as a social activity for the local miners and their family members, becoming increasingly popular as a way to pass time during the strikes associated with this period. Back in the day the instruments were tin kazoos and drums, they performed to a crowd in local carnivals and festivals in the area, often competing between villages. 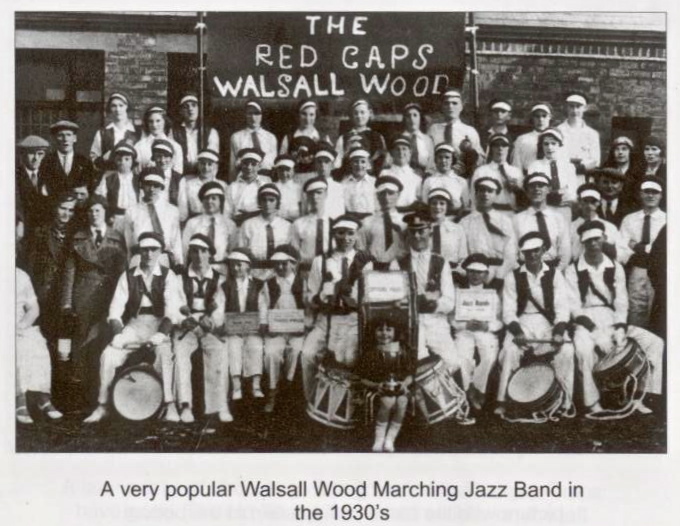 The Walsall Wood Red Caps were a familiar sight in the 1930s at carnivals and parades, along with several other bands from the area. Image from ‘Memories of Old Walsall Wood’ by Bill Mayo and John Sale. As the years went on the number of bands started to grow and started up in new areas such as the Midlands and Yorkshire, which are still popular havens today to some degree. 1973 saw the first England Vs. Wales competition which brought bands from both sides of the country together, this was followed the next year by the first World Championships held at Alexandra Palace in London. The late 60s and early 70s saw the largest growth of bands in the Cannock, Brownhills, and Tamworth region with virtually every town and village having at least one, although it is recorded that some bands existed in the Norton Canes and Brownhills West area as far back as the early 1930’s, my mother was a member of one of them as an eight year old. Back in the 70’s it wasn’t common for every family to own a car or take regular holidays so venturing out to a carnival on a band coach anywhere in the country every weekend throughout the summer season generated many happy memories for the children, parents and supporters that would stay with them for the rest of their lives. Valuable life skills were learned in terms of teamwork, discipline and confidence building that would put them in good stead for later life. All credit should be given to the trainers and committee members involved who through dedication and some personal sacrifice were able to get together, raise funds for band coaches, uniforms and instruments and provide the ongoing motivation needed to put some 30 or more children per band proudly out on to the streets in local parades, marching in unison, not for financial gain but purely for the love and joy of doing it. The Chase Royals were a big local band. Does anyone know if they’re still going? Image from Bandworld3. At some carnivals in the 70s it wasn’t unusual to see some 30 of these bands in a street parade each separated by a decorated wagon, providing a colourful display drawing in people to the main carnival events where the bands would later compete against each other for prize money. Some local bands were fortunate enough to be able to go abroad but whether abroad or at somewhere closer to home these children acted as fine ambassadors for their hometowns. A typical week would be training on a Tuesday and Thursday night, up early on the Saturday to catch the band coach to a carnival anywhere in the country, getting back late, sometimes near midnight, to get up on the Sunday and do it all over again. As lads we used to get some stick from time to time from mates who didn’t understand what we were up to but at the end of the day the girls outnumbered the lads about 20-1 so it was inevitable that long term relationships formed, I met my wife of 30 years through the bands as did many other couples. It’s very sad that they are no longer so popular and a pity that local communities no longer seem to organise the carnivals and street parades that used to be prevalent throughout the summer, local traders and councils are missing a trick there I think. After all, what could be better than attracting about a thousand kids plus supporters and members of the public to an event where they are likely to be spending money within the town at an event that generates community spirit? The sharp eyed will note this video is from our very own Stymaster. Bandworld – a great general memory site. Bandworld has some historic info relating to the first world championships held at Alexandra palace 1974, winners were the Tamworth Castle Marines This competition went on well past midnight due to the amount of bands involved, street parade was past the houses of parliament earlier on in the day. The Castle Marines were sponsored by the Castle Hotel Tamworth and trained at Whittington Barracks. Something I can’t find any further info on – a band called Ynysowen youth band from South Wales, they were formed after the Aberfan disaster from some of the monies received from round the world at the time. Some of the members had been in the school at the time of the disaster, they would never attend a Sunday competition as they wished to attend church in an act of remembrance. I can remember having some interesting conversations with a couple of the members at the time. Does anyone have any further information, please? This entry was posted in Brownhills stuff, Cannock Chase, Chasewater, Environment, Fun stuff to see and do, Interesting photos, Local Blogs, Local History, Local media, Local music, News, Reader enquiries, Shared media, Shared memories, Social Media, Spotted whilst browsing the web, Walsall community, Walsall Wood stuff and tagged bilston, Brownhills, Brownhills local history, Cannock, Carnival, Chase Royals, Chasewater, cinefilm, Competition, Events, Facebook, Heath Hayes, Jazz bands, local blogs, Local History, marching bands, New Photos, Parade, Polesworth, Rawnsley, Rushall, Staffordshire, Stuart Cowley, Tameworth, Things to do, Walsall Wood, Walsall Wood Red Caps, Ynysowen youth band. Bookmark the permalink. My Dad was in the GayTones (I’m not joking) which I believe was Norton Canes based and was wondering if there was any information on this marching band. If you look at the cine film that Wendy Jones is currently putting on you tube, look for a band in orange and white and that will be your dad’s band. Great Article, thanks to Stuart and Bob. Looked in the archives for the Gay Tones without success, but how times change. In 1950 there seems to have been the Gay Nineties Club in Tamworth, and I confess to going in the 70’s to the Gay Tower in Edgebaston. The Palace Theatre in Tamwort advertises a matinee called the Gay Ranchero in 1950, and in 1944 the gay singing sensation of Deanna Durbin. But in 1926 they advertised Richard Dix in the Rollicking Romance “Too Many Kisses”…the story of a young blood who just could not make his lips behave…. Should read “a gay young blood”! What a joy to read this post and to offer thanks to Stuart and Bob for such a presentation. ‘jazz bands’ fascinated me, and I would follow them for miles, when marching. I loved the band contests. Many were held on the Walsall Wood F.C. football ground at Oak Park. One in particular sticks in my memory – after competing in the playing and marching competition, the finale of the contest was for each band to offer an original tableau. The form of the tableau was a closely guarded secret, and bands went to extreme lengths to preserve the secret from other bands, while practising assiduously to get things right for the contest. bazooka”s and drums.. Yes, the Red Caps won the contest, Who could follow that ??? That would most certainly be The Norton Dandies. Don’t be put off by the name ! They were tough cookies when it came to competition. I believe the Mr Scott you are talking about could have been my Great Uncle, his name was Charlie, he went on in 1965 to train, and lead with a baton in front of the leader Paul Kendall the Norton Canes Militaires Jazz Band. The Bolehall Imperial Jazz Band at the Lichfield Carnival on Monday were awarded first prize and challenge cup. They became the Midland Champion Jazz Band, defeating seven bands, including the holders of the cup, Norton Canes Dandies. On Tuesday, at Stockingford, in a jazz band contest, Imperial gained first prize of £10, Norton Canes Dandies and Warwick Charity Jazz Band being second and third. I think the Red Caps changed their names to The Red Coronets, shortly afterwards. The Archives, at the moment, only has the local Tamworth Herald during this period that would just touch on the area. However more pages of papers are constantly being added, and in the about the last 14 months the number of pages has gone from 3.5 to 6.5 million! I will keep a look out. I see a New Aces swing band at the Mile Oak in 1941, and Black Eagles performing around the same time at Fazeley. Thanks for your efforts. I agree, The Tamworth Herald would be somewhat peripheral to our area, except for events on their own turf. Walsall Observer, the now defunct Walsall Times, the Cannock Advertiser. & E & S. would be a little nearer home. On the other hand, if the Black Aces won very little they would create little publicity for themselves. Also some recently found video from the 1980 World Championships at South Shields, originally a Tyne Tees Documentary running for about 50 minutes in 5 ten minute sections on you tube. Documentary was called “some people don’t call it music” it gives a good insight as to what it all entailed. Hopefully the link below will take you there. Loved the article, its so nice a history has been collected on these bands, I was in the Lichfield Three Spires (around about 1976) and were nearly always in the prizes our main competition back then was the Blue Birds. I loved every second of it, especially competitions. Lichfield Three Spires colours are bright blue, Orange and White. I have over four hours of old cine film of jazz bands my Dad had put onto video tape, I have transferred them onto a DVD, I need to make another copy (if I can remember how). I was watching some of it last night, there is the Chase Wakes showing the old grandstand, old swimming baths etc. blessing of the drums in 1970, taken in the Brentwood Suite, some old footage taken at the filming of Take Me High, in Birmingham, Heath Hayes and Norton Canes showing the old pit spills in the back ground (now housing), the exchange of the French troop both in Burntwood and France (where there is a clip of you) St Matthews hospital grounds, the old first orange and blue uniform, mention a few, some of the film is very poor quality, however, most of the early days of the Blue Birds and other jazz bands have been recorded. Do you remember the films shows he used to show?, we were all so excited to see ourselves on screen, how technology has advanced. Stuart I have sent Wendy your email address. I’m hoping you two can cook up some great history stuff between you. Brilliant. No worries chap, I know her dad had a wealth of stuff, only problem is it may turn in to a bit of a Bluebird thing, there were about 30 bands in just the Cannock area alone , it would be good to see some stuff from them but there seems to be very little about. hi Bob, Its Jill who was a member of the TGs Jazz band. I’ve spoken to Stuart and said to ask you for his email address if thats ok.
You should have Stuarts address by now – I sent a round robin on the 28th December with yours, Wendy’s and Stuart’s address. Did you not receive it? I have just emailed you, I also have a few old newspaper clipings of other bands, and there is loads of different bands on DVD, old cine film taking in the early 1970’s, also of the French troop we exchanged during 1974, film of Paris with the Blue Bird performing, there is a clip of you walking across the screen, I’m sure you will enjoy watching it. hope you and your family are well. You may not remember me but I was a member of the Trinity Georgians band and I recently came across lots of photos of different bands in the 70s which I would like to show you but dont know where to start. Any ideas? Morning Jill, nice to hear from you. I’m not too good on the technical side of things about putting stuff on to websites etc but if you make contact with Wendy Jones through this blog she seems to be more up to speed than me and has put a lot of cine film on You Tube including some of the Georgians, good luck. Thanks for replying back Stuart, will get in touch with Wendy. Hope you and your family have a lovely New Year. Apologies for the reply to your message several years later, but my Father-in-law, John Bate, recently passed away and i believe he was a member of the Trinity Georgians before going on to train the Polesworth Coronets. I wondered if he was in the same time period as you and if you remembered him. If there are any old photos of him or film of him, it would be gratefully received. i believe he was the base drummer. John met his wife through the bands so they hold a special place for the family. Hi Stuart, yes, I am on Facebook. I’ve had a look there are one or two with the same name but the TG’s have a facebook page if you’ve not already looked and anything I’ve seen of them tends to be on that page so that may be of use. Hi Conor, just received your email. I was in the Georgians when John was Bass Drummer, that is so sad that he has passed away. My condolences to you and your family. I have one photo of john, which I will try and send to you tomorrow, Do I send it to your email? Its the same photo that’s on the jazz band site where I put loads of 70s photo’s that I had..
where they were entered in, what is called, the first World Championship in 1974. Evening, Not sure if this link will work but thought you may be interested if you’ve not picked up on it already there’s another article on this blog called the long march and it contains links to a film on you tube called 50 years of jazz band history, it was first on tv back in 76 and a lady by the name of Lisa Ashby has added film and photos to a sound recording I had, the Georgians crop up half way through for anyone interested going back to1974.It’s film that is already on you tube of them but slowed down so you may be able to pick more folk out, I’ll leave it to you to spread the word Tamworth way on. I was a Blue Bird in the 1970’s (I could see myself in the old film) and I kept a scrap book of all the events which I still have, also there is about 5 hours footage of old cine film of events all over the UK and Wales, there is a lot of footage of local events. Dad used to give film shows in the old Burntwood baths. I also have a fair amount of old Blue Bird photographs taken in the 1970’s. I can remember most of my fellow marchers names. I was a member of the Trinity Georgians in the 70s and came across loads of photos of the bands we all competed against, it would be nice if I could show these to bring back memories for all jazz band members but not sure how to go about it, spoke to Stuart and he said to contact you. Hope you can help. You should have each other’s email addresses now – I did a round robin last night. Please let me know ifyyou haven’t. It is looking like it needs a dedicated website rather than deluge a site such as this with stuff and that’s where I get lost in the technicalities of it all. The last couple of months seem to have dissolved into thin air. My main interest has been the old shops in the Burntwood and surrounding areas. I call it “One hundred years of shopping in Burntwood”. I have been collating it into book form and have gathered a fair amount of information and old advertisements and photographs, I have well over 100 hundred pages of information of shop keepers and items they sold to the public. It has escalated from writing about shopping with my mother when I was a young girl and I used to walk past the shops to school. Thanks Stuart for contacting me onFriends Reunited. I was in the Longford Troupers in the early seventies and reading all the comments has bought back fond memories of rehearsing our routines ready for the weekends competitions. Every child in our street had a broom handle with some kind of weight on the end to march up and down twirling them and launching them into the air. I still get the urge to do it occasionally on the rare occasions I find a broom in my hands. Yes, how odd is that, I was trying to make contact with you this week but ended up speaking with a confused woman in a residential home. I’m not allowed to go on Facebook fully with my job but I do go on for local history sites and also some of the marching sites and I’d picked up that there was a reunion in September. I’d picked out your surname because it was unusual and was trying to go through the bt phone directory to make contact. I was just trying to get a message to someone regarding clips on this site (street carnivals and the link to the documentary in the comments) and also a Wendy Jones under the heading Chase Wakes has clips of a lot of the Welsh bands on youtube but you have to wade through about 40 clips, they are from about 1974.So I’m glad you’ve made contact for me to explain, hope the clips are of use. hi stuart thank you for trying to contact me. through the vague message I had and remembering your name from a reply I sent you before about ynysowen band and wendy jones help here we are again. sorry about the mother in law but she confuses us quite often im surprised she remembered your name. looked at the clips of the chase wakes theyre fab lost count of how many times I watched them haven’t found our band but im sure we can use some of these clips if possible at the reunion, what a talking point as theres quite a few welsh bands there and we are hoping some of those band members will come to the reunion we have a few of our band from the 70s so hopefully it will be a good night. Thanks again stuart for this information and I will let you know how it goes. Chase Royals Are still going strong. And still taking part in competitions around the uk. Hi Ann, Did you know Marianne Uden who was in the Rosettes in the 80’s. Hi everyone. I was a member of the Lichfield Crown Premier Jazz Band for many years. I remember we used to practice in the old scout hut and we use to practice at the Willows school hall next to them. There was always rivalry but that made it very interesting to us kids. Shame it all came to an end really. The comps were great! I was an actor in the film ‘Knights & Emeralds’ released in 1986. A film about a teen romance and marching bands. One of the bands in the film was THE RUGELEY ROSETTES’ I am trying to trace a friend from the Rosettes who was also in the film. Her name was Marianne Uden. If anyone has any information on The Rosettes please let me know. My email is steviepage@hotmail.com 07968521514 My name Stephen Page. This has been put together by a Brownhills lass by the name of Lisa Ashby who, I understand, has had nothing to do with the bands over the years but took it on herself to put this together, so on behalf of everyone associated with the Bluebirds at the time I’d just like to say a big thank you. Audition at Birmingham on a Thursday in August 1973, following Saturday filming from 6 in the morning. All those associated with the filming were gathered in the Victoria square area by the town hall. We did 6 runs of the street parade so that they could take various shots and if anyone is wondering what it was all about, we were part of a promotion for the opening of a new restaurant in the city according to the storyline. We attended the premiere at the ABC Bristol street Birmingham and the film was released early 1974. I think in the States it was known as “Hot property” over here it was “Take me high” I’m on the very last row of drummers, kerbside so got about 2 seconds of fame. Thank you again to all involved for the memories. I’m due to post it up at the weekend – Lisa recently did the Black Country video I featured here, too. Ok chap, I’m always bowled over when people put themselves out like that, makes a change in this world we live in. Same with all the work you do on this blog. Keep up the good work I’ll get back to my fraud cases. It’s my job (financial services, not committing it I might add), that’s why…..frustratingly….I won’t go fully on to facebook it bothers me that dubious individuals could get back to family and friends so all I’m able to do is observe. Understood, and you’re always welcome here! Can I put you right on a wee bit of information regarding the Castle Marines? We were not sponsored by anyone only the parents of the members and of course the members themselves with endless money making schemes from selling home made cushions, tea cosies and loads of other things I can even remember. We, along with all the other bands in the early 70’s had a fantastic time out most weekends and practise sessions for about two – three evenings a week; which for us paid off as we won the first World Championship down at Alexander Palace; boy what a weekend that was!!! Hope you keep these pages going as it is good to remember, even though it makes me feel my age. Evening Sue, remember you and your family well, thank you for your contribution and sorry about the sponsorship issue. It was rumoured that the Bluebirds were sponsored by the toffee people, all we had was a couple of stickers for the coach just shows how Chinese whispers work. Yes , thanks to Bob there is a good record of the early bands here, he’s put a lot of work in I’m hoping that you’ve managed to see all of it. Wendy Jones has put a lot on about the Bluebirds and also on you tube if you search her name followed by “Chase Wakes” you’ll see a lot of her father’s cine film from the early 70s which include other bands .I try and keep things generic, so in the links in the comments here there is the hour long documentary from the 1980 World champs, also if you search on this blog for “”the long march,50 years of jazz band history” you’ll see a 30 min documentary from a sound recording of a documentary first broadcast in 76, a lady by the name of Lisa Ashby did some smashing work on that. Bluebirds have a site on facebook and I think your dad pops up on a few of the photos there along with his famous hat. I think somewhere in these replies there is a link to some film from the 1930s showing bands which is a bit weird because my mom was probably in one of them. So happy viewing, I’ve not been able to find a lot on the Marines so you’ll have to do some digging in your scrap books. Just come across another piece of film so I’ll stick it on here before the link gets lost. Both my parents Edna Birch and Edgar Whordley were in the Red Caps Walsall Wood. I have some photos of them in the Red Caps uniform taken sometime before they were married. They were married in 1942. Cheers Christine,Dig the photos out I’m sure Bob will find a home for them somewhere.